Kindly be informed that i'm a mechanical engineer works at El ezz el dekhila steel company hot strip mill, we are facing a problem that we are greasing the radial taper roller bearings with Mobilux EP2 and during operation we observed that the thickener of the grease was separated from the base oil, can anyone tell me the possible reasons for such failure that i should look deep in it? Using thermogun , what is your grease operating temperature ? Mobilux Ep 2 is simple Lithium complex grease not very suitable for high temperature in steel mills try Elba Polysyn 2 Its urea base with synthetic oil. 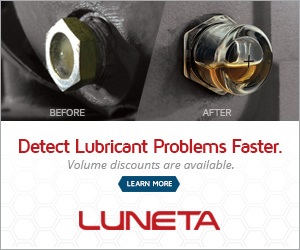 Elba Lubrication Inc. Check compatibility before you go from a Li-complex to a polyurea. In fact, check compatibility before you change to any different thickener type. If it is a total loss lubricartion, makes no sense to apply a synthetic grease. A mineral oil grease thickened with polyurea is probably the best choice for this application, for example Kluber STABUTHERM GH 461. ......" Mobilux EP 2 and 3 are general-purpose greases. The recommended operating temperature range is from -20ºC to 130ºC but they may be used at higher temperatures if the lubrication frequency is increased accordingly..."
Please check the current operating temperature. Should the operating temperature be higher, and higher that 120 C, you will need to move to a high temperature grease. High temperature greases may be Lithium Complex or even Poly urea. Please ascertain compatibility, when switching to a non lithium grease. All greases have a drop point and the dropping point of a soap-thickened lubricating grease is the temperature at which it passes from a semi-solid to a liquid state under specific test conditions. It is an indication of the type of thickener used, and a measure of the cohesiveness of the oil and thickener of a grease. On extracting details from the PDS, Mobilux EP 0, 1, 2 and 3 greases are recommended for most types of industrial applications including heavy-duty applications where high unit pressures or shock loads are present. These greases provide excellent protection against rust and corrosion and resist water wash-out which makes them particularly suitable for equipment where moist or wet conditions are common. Mobilux EP 0 and 1 are suitable for centralised systems. Mobilux EP 2 and 3 are general-purpose greases. The recommended operating temperature range is from -20ºC to 130ºC but they may be used at higher temperatures if the lubrication frequency is increased accordingly. Further the dropping point is 190 C.
In your application please confirm that the working temperature is within the parameters furnished.